Just picked up a Rickman Zundapp frame. Am looking to build up a pre 75 racer using an XL250 motor If I can make it fit. I'm shooting for lightest weight and big horsepower.......any input welcome. HP and performance depends on how you want to run it and how far you want to build it. The 2 most radical engine builds for a 250 engine are the Powroll Flattrack engine that is documented on the OldRice web pages and the Pat Orman 360 build. So it really depends on your intended use for the engine. If you are class limited then you need to figure out what you can build it to within the class limits. The Powroll build can be built as a stock bore/stroke 250cc engine or enlarged to 300cc plus size. The Orman 360 is basically a design that I thought about years ago but Pat was the one who built a couple of them. 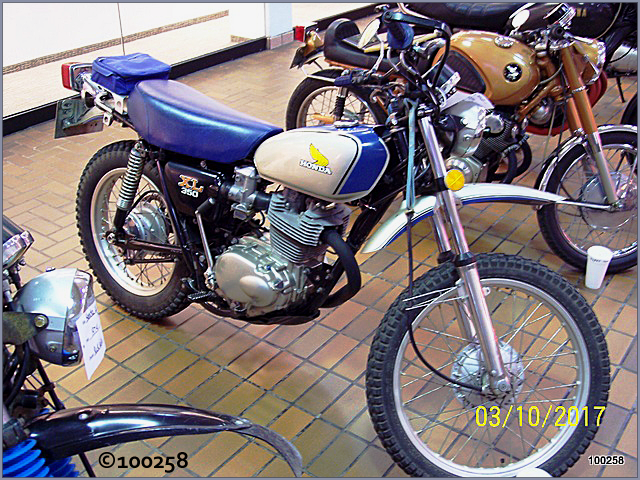 It was built to fit 360-400cc class limits with a stock stroke and big 89-89.5mm bore and an XR500 rod. The cam is the same as the Powroll build, the biggest Megacycle 12790. The carb is basically the same 38mm Mikuni. The real difference is that the Powroll build uses a 250 head (with 350 valves) and Pat's engines used the 350 head which already has larger ports and the bigger valves. What kind of racing are you planning on? Either of these engine builds will put out 35+hp at the rear wheel. Neither is a "cheap" economy build. Hi Swiss.....I'm racing pre 75 vintage mx. Motors must be sideport but we can do any mods we like. I have a couple of 250 motors so that's what I'll be using.My stock framed bike is 280cc, 32 mikuni, bassani pipe. I've pulled the mag off and run a total loss points ignition.The bike actually goes pretty well considering the head and cam are stock. Removing the flywheel weight made a big improvement. I'd like to try a Web cam and better valve springs in this bike. For the Rickman project I have a new 305 kit to use. I need to get a good cam,springs,valves,carb......and I'd like to run an electronic ignition. Also need to work out what compression the 305 kit will give me and if it's worthwhile running on methanol. Methanol seems to be real popular Down Under and I have emailed back and forth with a few racers who favor the extra power and cool running of the Meth bikes..Compression ratios used to be run really high using Meth but it seems that there is some good performance from running the Meth even with lower compression ratios. For a really good engine build the XL heads require some work. If you have ever looked at one of the very trick Flattrack heads, they have had some extensive welding done to up the compression ratio and promote Squish! Basically the areas that taper up to form the chamber are built up with some welding so that they are flatter and push the gasses in the cylinder to the center of the chamber at TDC.. Thing is that in order to do it well, it gets expensive because you are probably looking at replacing all 4 of the valve seats when you do the porting job on the intake and exhaust. You can build a good running engine without going that extra $$$. But for an all out engine you have to take advantage of all of the tricks! Course if you have $2500 or so you can also buy one of Pat's Falicon Super Crank/Rod combinations! There is really no limit to how much you can do and how much you can spend! A well ported 250 head with 350 valves (preferred stock 350 size stainless) would run fast and reliable with your 305 kit. I think most of the older 305 kits were fairly conservative with their compression ratios, typically about 11-1.